This West Coast IPA is the last of the four hoppy beers I brewed over four consecutive weekends earlier this fall. The recipe owes some similarities to the 100% Brett Trois IPA I brewed earlier this year, but odds are they won’t taste very similar. Fermentation with WLP007 (Dry English Ale) harvested from the Hoppy Cream Ale will give this batch a very different yeast profile, and the Simcoe-heavy dry hop will lead to a resiny aromatic profile compared to the tropical fruit packed aromatics of the Brett IPA. As a side note, White Labs recently announced that WLP644 Brett Trois will be going year round! I’m interested to see how the Briess Pale Ale Malt I used as the base malt for this IPA performs in a hoppy beer. I didn’t realize when I bought the sack that the color is about double the Lovibond of the CMC Canadian 2-Row I’d been using previously. We’ll see if the slightly toastier flavors come through in a positive way, without making the beer seem too “English.” The Dank Amber IPA recipe was based on even darker/toastier Best Malz Vienna and did not taste overly-malty, which seems to indicate the pale malt won’t be an issue. While writing a recipe for a hoppy beer I usually default to an even split of my chosen hop varieties, with similar additions made on both the hot and cold sides of the brewing process. From there I can adjust subsequent iterations based on which aromatics I want to highlight, replace, subdue, or eliminate. Even though this is my first attempt at this recipe, I'm using varieties I’ve brewed with numerous times before. As a result I decided to focus on the more citrusy varieties (Citra and Centennial) on the hot-side (hop-stand and hop-back) and then follow that with the pine-ier Simcoe for dry hopping. My goal was to create a beer that evolves more as it crosses the palate. We’ll see if it works. The way that homebrewers tend to think about hops is as discrete spices. (e.g., Cascade adds grapefruity flavors. Galaxy is more tropical. Grassy-spiciness calls for Saaz. etc.) However, unlike the wide variety of spices in your pantry, hops are all varieties of the same plant species. As a result many of these flavor differences result from different ratios of the same set of aromatic oils (although not all hops share an identical set of aromatic compounds). I watched a video a few months ago of an interview with Pat Mcilhenney from Alpine during which he mentions that when they develop a recipe for a hoppy beer they target a standard ratio of hop oils. He didn’t provide their actual target though. Their hoppy beers, especially Hoppy Birthday, are so good that I couldn't ignore the suggestion. Despite making up only a tiny portion of the hop's weight, the hop oils provide the aromatics, as opposed to the much more prominent alpha and beta acids which create the bitterness. I’d never thought about the amounts of myrcene, caryophyllene, humulene, and farnesene etc. in my hop blends before. Here is a list of aromatic descriptors for these as well as many other hop oils. The Beer Sensory Science blog also has several interesting posts about the chemistry underpinning hop aroma perception. To help me better understand what is happening in different hop blends I created a spreadsheet (free to download here - HopOil-PercentageCalculator.xlsx) that calculates the percentage of each oil given the hop bill. 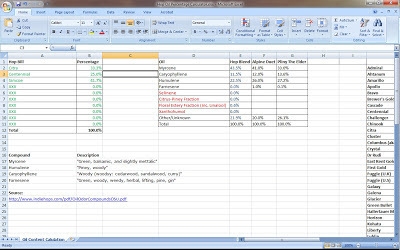 Select a hop you want to add from the drop-down lists on the left and enter its percentage of the hop bill next to it in GREEN (the table at the far right contains average values for total oil content and a breakdown of those oils - if anyone knows of a more complete or reliable source, please pass it along). The results are populated in the middle table in BLUE. In most cases only the most common four oils were specified, so don't trust the percentages of the others unless you ensure that all the selected varieties include percentages for the other oils. For comparison I included the percentages that these average hop numbers spit-out for Alpine’s Duet, which Pat noted is an even blend of Amarillo and Simcoe, and Russian River’s Pliny the Elder (using only the late boil additions and dry hops). 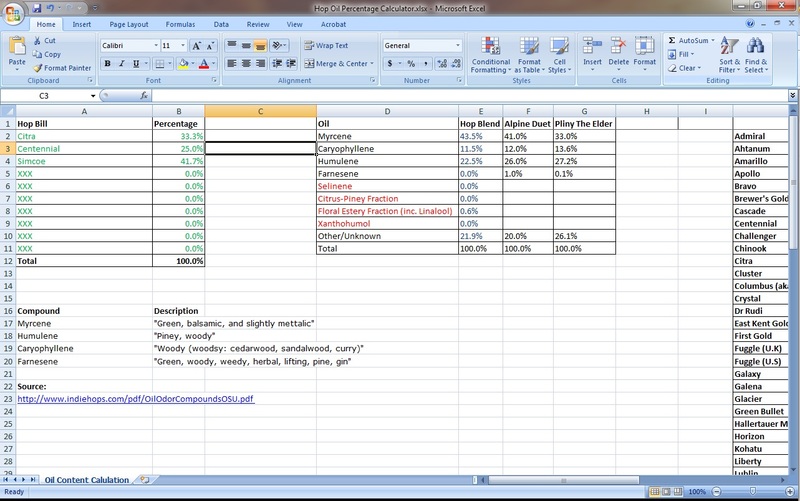 Checkout Scott Janish's Hop Oil Calculator a web-version/update to my Excel sheet as well! The timing of the hop additions plays a role in the final aromatic profile as well because some oils are more volatile than others. The sheet does not take this fact into account. While the big four mentioned above account for 70-90% of the total oil content of most hop varieties (according to Indie Hops, pelletization tends to reduce the relative percentages of humulene and myrcene, for better or worse), there are other oils that contribute substantially and positively to hop aroma. As a result two blends that reach the same ratio of the four "primary" oils, will not yield identical beers. I was not able to find average values for all of the oils for each hops, not to mention that there is a huge within-variety variation resulting from growing and packaging conditions. As a result, I wouldn’t suggest using this spreadsheet for anything too serious unless you obtain an actual analysis of your hops to use in place of the generic numbers. I’ll be brewing a couple less traditional hoppy beers this winter. Jacob and I are currently working on test batches for a split batch of wit (half with hibiscus, half dry hopped with Galaxy and Rakau) and a hoppy tripel, evolved from a batch I brewed a few years ago, this time with Amarillo and Simcoe. 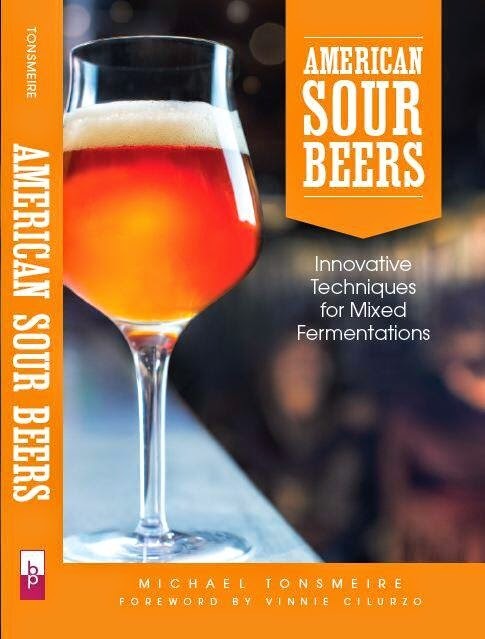 I enjoyed the history in Mitch Steele’s recent IPA book, but now I’m really excited about the scientific and process details in Stan Hieronymus’s For the Love of Hops (especially after talking with him while we were both visiting Crooked Stave’s tasting room during GABF). 1.25 oz. Columbus (Whole, 15.00% AA) @ 60 min. 1.00 oz. Simcoe (Whole, 14.00% AA) @ 10 min. Filtered DC water cut with 4 gallons of distilled. 8.5 g of gypsum and 4.5 g of CaCl split between the mash and sparge. Collected 7 gallons of 1.055 runnings with a fly sparge. Chilled to 61 F. Oxygenated for 45 seconds. 1 cup of yeast slurry harvested from Aromatic Cream Ale. Left at 64 F to ferment. Good fermentation by the next day. 12/2/12 Added the first dose of dry hops (2 oz), bagged and weighted, to the primary fermentor. Not as much hop character as I would have expected at this point, but the dry hops will help, so I'm not worried. 12/16/12 Added the second dose of dry hops, bagged and weigthed to a sanitized keg. Flushed, and filled. Down to 1.013. 1/10/12 One of the best hoppy beers I've brewed. Bright, fresh, citrus, tropical, and pine. Maybe slightly sweet (or just fruity? ), but with the right amount of bitterness for my tastes. Lots of goodness to digest here. Ill have to read this one or two more times to absorb it all. Looking forward to my favorite part tho. Tasting notes! Can you walk us through how you select what type of beers will get 20,15,10 min additions and which get just the hopstand/hopback/dryhop only? I learned from the brett IPA that you can get a lot of flavor from a hopstand/dryhop combo and have been focusing on that. Just wondering how you decide which beers get late boil additions. Do you recirculate during your hopstand? Also, isn't adding whirlfloc prior to the hopstand slightly counter-productive? Very cool stuff here. I've heard so many rave reviews about Alpine's hoppy beers. I've got to get out there and taste them. One note about the spreadsheet. I put in the hop bill of the best hoppy beer I've brewed, and it falls in line very closely with Pliny. Crazy. Those guys definitely know a thing or two about hops. Why do you choose to harvest a yeast cake rather than use a starter from a pure strain? For lower bitterness beers where I still want a saturated hop flavor/aroma, I sometimes opt for the late boil hop-bursting additions to provide the bitterness. I find the bitterness from late boil additions to be pretty soft, so I choose earlier additions for beers I want to have a “grabbier” bitterness. I’ve recently started splitting the bittering addition between hop extract (HopShots) and Columbus, because extract tends to have lower/softer perceived bitterness as well. The combo of a hop-stand with either a second dose of hops added at the start of chilling or in a hop-back (lower temperature extraction), followed by two dry hoppings with the second addition in the keg, is working wonders for my hop-forward beers. I honestly don’t taste a huge amount from the late boil hops when there are also these additions made later in the process (which is to say if you want to save hops, skip the late boil additions and just bitter). Late boil additions are more valuable for moderately hoppy beers, like a saison or a pilsner I find. I do not recirculate during the hop stand. It would probably increase the aromatic yield from those hops, but in my case it would also require adding the hop-back inline after the recirc was complete. I will stir the wort every few minutes while it is resting to improve wort-hop contact. What is your concern with adding Whirlfloc followed by a hop stand? Whirlfloc is a kettle fining designed to coagulate proteins in the boil. It shouldn’t cause any conflict with the hop additions that follow. As for repitching, as long as my sanitation was good, what I harvested will still be a pure strain. Most craft breweries repitch the same yeast from batch- to-batch 8-10 times before buying a fresh culture, although some do it indefinitely to create a house strain. In this case it is much easier and cheaper to harvest a cup of slurry than it is to buy and propagate a fresh culture, especially when you time your batches correctly. Some brewers think it takes a few batches for the yeast to become adjusted and produce its best beer. Too long and you risk genetic drift, even if you prevent other microbes from invading. Regarding the Whirlfloc comment : I was actually wondering if flocculating agents would prematurely precipitate hop material. Probably not when using whole hops, but could it be an issue with the use of pellets during a hop stand? Tried to donwload the XLS file but getting page not found. Someone caught an error with the original file (I was double counting the fourth hop), so I deleted the old one and uploaded a fixed copy. Forgot I'd linked to it directly. Link should work now! The Whirlfloc mainly affects proteins. If anything coagulating them before the hops go in will help prevent the pelletitzed hop material from serving as a substrate for protein collection. An occasional stir isn't a bad idea during the hop stand to keep the hops moving though. Link works now thank you. Are you cooling the wort before the hop stand, and if so, at what temperature do you cool the wort to? I do not chill the wort before I add the hop-stand hops. I just toss the hops in right after turning off the burner. I figure that extracts a certain set of compounds, and the hop-back extracts another considering by then the wort has usually naturally chilled to ~180-185 F by the end of the 30 minute hop stand. No question - just wanted to say thank you for an awesome blog, very in depth analysis and very timely advice. Working on a sessionable Simcoe/Centennial/Mosaic/Citra/Galaxy IPA recipe and this definitely answers a large portion of my questions. Has anyone else checked the oil percentages for other hops on the list? Sounds like a great hop combo, Amanda! Last night I tasted a Mosaic heavy beer a friend brewed, seems like a great addition to an otherwise fruity/citrusy grain-bill. The accuracy of the hop oil percentages is something that is tough with the spreadsheet. I found large, and often conflicting ranges for many of the hops in there. I've noticed, and heard the same thing from several others, that there almost seem to be two kinds of Simcoe. One more tropical-mango, one more dank-pine. That might explain some of the discrepancy? Mike, when you recirculate or use a hopstand what temperature range do you shoot for? I recently read a great article on the Beersmith blog about farnesene having a boiloff temperature of 147 F. Do you whirlpool at or below this temp? I have been itching to run an experiment testing the difference in two batches with the only variable being the temperature of my whirlpool. Thoughts? Keep rockin man, I don't know how you post so much high quality content so often, I am hooked though! Farnesene is a pretty much irrelevant essential oil when it comes to IPAs. Most American varieties have less than 1%. It is much more prominent in noble hops, although there is plenty of debate over how important its flavor contributions actually are. From Brad’s article, it is actually myrcene (which is very prominent in hops like Amarillo, Citra, Cascade, as well as many of the Southern Hemisphere varieties) listed with a boiling point of 147 F. However, most other sources list it as boiling at 333 F (167 C). However, my understanding is that this it will still volatilize at temperatures well below that. I add the hop-stand addition right after the boil ends, and allow it to sit for the prescribed length without force chilling. As I tend to skip any other late-boil additions, this is what gives my beers a longer-lasting, more saturated hop flavor. I found without an extended hop addition at/near boiling, my hop aroma did not permeate so completely into flavor. This was my complaint when using the standard flame-out and chill as fast as possible method advocated by Jamil and others. By the time the hop-stand is complete the wort is usually down to about 180 F. When the wort runs through the hop-back on the way to the plate chiller, the shorter/enclosed exposure at a lower temperature, prevents the loss of the more volatile hop aromatics. Dry hopping is also the best way to the fresh “green” myrcene aromatics in my experience. I’ve heard some discussion about trying lower whirlpool (hop stand) temperatures for hop additions from a couple brewers, like Jeff O’Neil at Peekskill, but never tried it myself. With the more rapid natural cooling of homebrewed wort (given the lower volume) it might be worth doing an 80 minute hop stand with ¼ of the flame-out hops added ever 20 minutes (or something like that) to get the full range of hop aromatics. Interested to hear your results if you get around to doing an experiment. Just read the 80 min, 4X20min additions thought and will try it now. Am brewing in two kettles, so I'll do that with one half, and a 30 min hop stand with the other. This is a great looking brew, 20 min to go on the boil, I'm excited. Just got this (with a couple of changes based on available equipment) in the fermenter and am very excited. My local beer paradise was out of hop extract so added .5 oz Columbus at 60 min to compensate. Also, steeped 2 gallons of sparge in 2 oz. centennial and 1 oz. citra for 30 min at 150 degrees in addition to the back hop. Looking forward to the taste test, thanks much for this recipe! I just took a sample of this and it is INSANELY FREAKING GOOD!!! Thanks so much for sharing this recipe. I think the raw numbers are more important than the ratio. These days I am around 100-150 PPM for both chloride and sulfate, but that is for New England style. For West Coast, more like 200 PPM sulfate (and up), 50 PPM chloride (and down) to accentuate the bitterness and dryness. Best of luck! Thanks for the great recipe, this won me 1st place in the IPA category out of 43 entries recently! Only thing I did different was use wy1098. After brewing NEIPAs for the last three years I should go back and rebrew this one!